History to make you hand, we offer these two articles that will suit beginners. The first presents the game in outline and the other gives you tips for your guild island. Do not hesitate to consult them. At a time when the MMO are more and more beautiful graphically, and with mostly 3D, Sandbox interactive bet on a style a little less ambitious. However, it must be admitted that this choice is rather bold on their part. So we are faced with a cartoonsque style a bit impersonal with a hack'n slash view. Visually, it remains at the limit of the correct, moreover the artistic direction does not shine either. Apart from a few illustrations, the tone is sober with rather classical decorations overall. But then why is this a bold choice? For two reasons. The first is that it is accessible at first glance. It's simple and we find ourselves very quickly contrary to the immensity of the 3D environments that can scare. In addition, this allowed developers to propose their game on the tablets under IOS and Android. Ideal to sit in front of the TV or on the throne to farmer a little. However, it should be noted that the title is not compatible with a not inconsiderable number of machines. So take the time to check if yours is. 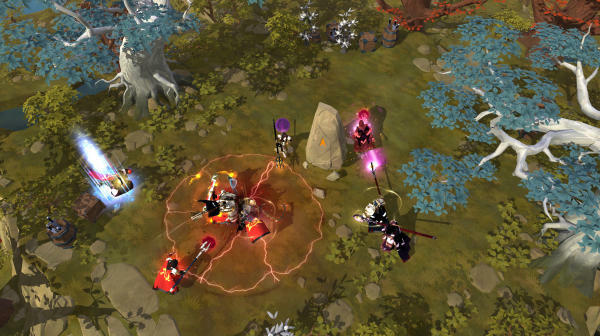 Albion Online offers a kind of mix between Dofus and a MOBA hence the simplicity of the graphics. The second comes from its gameplay. One can consider that Albion Online is a mix between Dofus and a Moba. Indeed, we find a lot of mechanics proper to the latter genre. Whether traveling or in team play. When we see PVP between two groups of players, we could almost make the parallel with a "teamfight" of League of Legends. The spell panel is another example of similarity with MOBA. Where it can not please everyone, it is by its subtype "Sandbox" where the player is left to himself and has to create his own adventure. 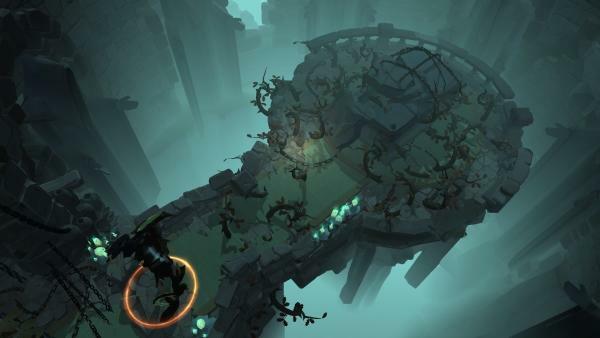 If you like to be guided by quests with a semblance of history, Albion may not please you. If this particularity is an undeniable asset to stand out, we note that the beginnings are not attractive enough for new players. We start by creating his character with little personalization. Then we learn the basics of harvesting wood, stone, and animal skin to get to craft to make our own beginner gear with tools, armor, boots, a weapon and a shield. You will also have a mount via a last quest to the first city of the game. After that, you are completely surrendered to yourself. The beginnings can therefore be difficult if you are not a minimum prepared. 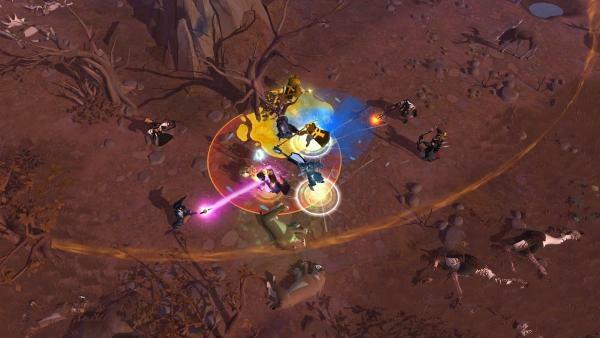 Even though the experiences are varied, Albion Online still focuses much on the PVP. To launch alone in the adventure is surely not the best way to appreciate Albion under penalty of having to carry out many unpleasant tasks that can quickly make you lose. On the other hand, everything is done to encourage us to join a guild from our very first steps. From there, you can understand things in a user-friendly way. In any case, you will be forced to perform repetitive tasks for the good of your community. One last thing that sets it apart from other MMOs is the fact that it is very PVP oriented. Again, some will not like that bias. Obviously, the PVE and the trades also have a great place in the game, but the PVP remains a dominant component, there is no doubt about it. The whole is strewn with struggles between guilds that punctuate the conflicts in the world of Albion. We return to this inevitable ultra-communal aspect. Apart from this bias taken completely from the developers, Albion Online also has quite a few trumps in its sleeve. Started by the displacements which take a real importance here. Given that teleporting, to which a lot of games have accustomed us now, costs almost an arm (the more things you have in your inventory and the more it costs you), almost all actions are done on foot. This side a little role play and more authentic allows, at high level, to experience the transport of dangerous goods, attacks of raiders, and other dangers orchestrated by unscrupulous players. But as the other would say: "It's the game my poor Lucette." Obviously the beginner zones are not concerned. If we were talking about accessibility at the beginning of the test, the app still has nothing casual. In these same risk zones, the death of your character is punitive to the possible. So you lose everything you have on you set apart your gold. Moreover, driving you criminal increases your bad reputation and can deprive you of some useful services. Albion can be cruel, but it is also what makes it interesting. Albion Online offers an interesting alternative to classic MMORPG classes and races. The other attraction of Albion Online is being able to become anyone. Indeed, you are what you wear. Here, no race or class, only equipment and master levels to carry them. This system makes it possible to try out new combinations and enormously varied. Looking at the sign of fate and its many branches, one could almost get lost, but it also denotes a wealth in terms "classes" that one incarnates through clothes. For example, a mage may very well use thieves' boots to gain mobility or put on an armor for the "Tanks". In addition, it is possible to choose different spells on each equipment. This one is not definitive, it is therefore possible to adapt according to the situations. The game greatly encourages specialization, but fortunately the choice is wide, and that of combat is not necessarily the most profitable. Indeed, harvesters, artisans, managers, traders, many trades have their importance in a guild to ensure its proper functioning. Because guilds can own territories and workshops in capitals and then impose taxes on all other players. The fight between the guild is a very encouraged sport in Albion where real armies can compete on a battlefield for example. For reminder Albion Online is a "Buy to Play", in other words when you buy one of the packs of the game, you can play there for life. However, there is a premium mode that gives different bonuses of progression (gain of more important pieces of money, the reputation which rises faster, harvest bonuses ...) which quickly become indispensable must be confessed. Fortunately, the system is fairly honest because you can pay for your subscription with the money of the game. However, you have to invest a lot of time. The MMO can quickly become addictive and time consuming. It is also worth noting that the official site offers a lot of content to help you in the adventure as a character builder tool to observe the best builds (PVP, PVE, Mixed...), as well as some guides even if they are in English. We end with a small note on the ambience sound that is very classic too. No epic or repetitive music but nice atmospheres that are perfect for a sandbox game. Albion Online offers another way to play the MMORPG. Its both accessible and old school side gives it a certain cachet. It should be borne in mind, however, that it will not necessarily appeal to hard-core followers of the classical titles of the genre. Solo players may find it difficult to enjoy the beginnings, but the adventure of many is really pleasant. It is still lacking finishes but the Sandbox Interactive title is really interesting to try.